Did you catch the “30 Days of Real” phenomenon a few months ago? I deeply appreciated it. I think many others found it silly. It was described as being “one month of sharing our realness, messiness, quirks and funny flaws to become more authentic, vulnerable and beautifully imperfect.” People were challenged to post something about themselves, once a day for thirty days, that gets closer to “the real them” and wouldn’t necessarily pass muster for civilized conversation without making people uncomfortable. Our culture lacks authenticity. Our social rules and norms are so full of pretense. Perhaps it is when we make mistakes that we ratchet it up even more to avoid “losing face.” To use a very important but neglected Christian word, we do not have a culture of confession. We don’t know how to say we’re sorry or admit our flaws. 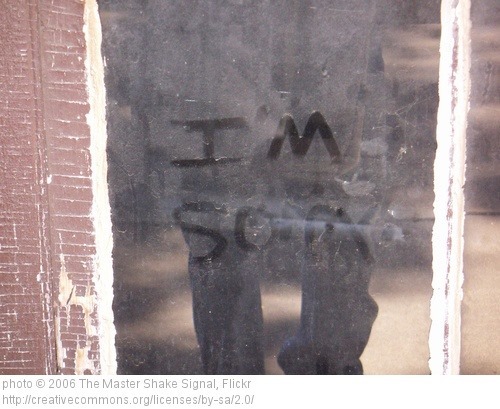 Saying you’re sorry carries with it a lot of other things that are emotionally painful and mentally laborious, like admitting you messed up, revealing something that was once hidden, and perhaps even relinquishing social leverage you feel you have. Confession is a difficult discipline for us because we all too often view the believing community as a fellowship of saints before we see it as a fellowship of sinners. We feel that everyone has advanced so far into holiness that we are isolated and alone in our sin. We cannot bear to reveal our failings and shortcomings to others…Therefore we hide ourselves from one another and live in veiled lies and hypocrisy. As I thought about the 30 Days of Real stuff, it dawned on me that I’ve almost never practiced confession with the two people in my life for whom it is perhaps the most important: my children. When I screw up as a parent—handling a situation improperly or what not—I might, on a good day, admit it to my spouse or a good friend. But I don’t even give a thought to admitting it to my children. After all, they need to see me as the one who’s always right…right? As many of us know, our children learn by what we do, not what we say. But this truth becomes particularly disturbing with the practice of confession. In order to teach that by example, that means I have to mess up, and then teach my children what confession is…by doing it myself. I’ve had many missed opportunities to do this. I recently—finally—took advantage of one, and it was as difficult as I thought but more healing than I expected. One particular day, my son had pushed me to the limit. Well, let’s be honest: I had a pretty low limit this particular day. It was only 8:00 in the morning. I blew up at him. It was one of those moments we have as parents when we lose all civility, enough that in your later moments of guilt, we start irrationally worrying about who saw or recorded it. Later that day, I sat down with my son to talk about the situation. Before reminding him what his behavior had been and why it was not OK, I started with me, and told him I was sorry for reacting the way I did. “Yes I am,” I said, and he leaned into me as we finished talking. That was it. There was no background music or fireworks, no confessional booth or priest. Just a moment of confession that we need to have more of. Actually, a priest might have been easier. It’s far more difficult to apologize to the person you hurt. I’ve had adults in my office whose relationships are falling apart partly because no one has ever confessed to the other. The Bible contains more of this human vulnerability than we may realize. One of my personal favorites is Paul’s lament in Romans 7 of his own hypocrisy and inconsistency: “For I have the desire to do what is good, but I cannot carry it out. For I do not do the good I want to do, but the evil I do not want to do—this I keep on doing.” (Romans 7:18b-19). Jesus, on multiple occasions, praised vulnerability and honest confession over a good public show (Matthew 6:5-6; Luke 15:21, 18:10-14). Part of what makes the Bible uncomfortable for some is that it can be so raw and real. From Noah getting drunk and naked right off the ark (Gen 9:20-21) to David’s sins and confessions (2 Sam 11; 2 Chr 21; Psalm 51), the Bible is full of real life as we know it but may be too pious to admit. As Foster says, “The discipline of confession brings an end to pretense.” My adult relationships have enough pretense already. May my children know the real me, the flawed and imperfect me, and hear a healthy dose of confession when I am wrong. Tags: 30 Days of Real, children, confession, family, kids, parenting, Richard Foster, spiritual disciplines. Bookmark the permalink.